Since 1981, What’s New in Electronics has provided the professional electronics industry with its premier source of new product and technology information. Fully integrating the New Zealand & Australian markets, its new product focus on components, design tools and test equipment has proved a success with advertisers and readers alike. 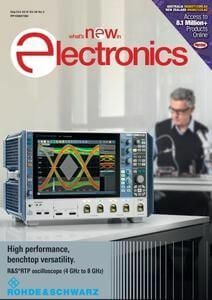 Regular editorial features include power supplies, RF systems, batteries, cables & connectors, test & measurement, embedded solutions, design engineering and semiconductors.